Merguez is a spicy North African sausage that is popular in Morocco. They are grilled and rather easy to make from ground lamb or beef, or a mixture of the two. In Morocco, you can buy fresh merguez sausages in skinny three-inch links. When making merguez at home, you can feed the mixture into sausage casings or simply shape it into patties or cylinders. You will want to have merguez spice mix and ​harissa (a spiced chili paste) on hand. They contribute to the sausage's signature taste and color. Feel free to make your own merguez spice mix or use store-bought. As with any sausage, fat is the key to creating the best flavor and texture. Try not to skimp too much on the fat if you feel the need to adjust the recipe. In a large bowl, combine all ingredients except sausage casings (if using) in a large bowl. Knead the mixture well to evenly distribute the spices, herbs, and harissa. Alternatively, you can pass the ingredients through a meat grinder and feed the merguez mixture into sausage casings. For the best flavor, allow the merguez to sit for 30 minutes or longer in the refrigerator before cooking. Place on grill or under broiler until cooked through and meat registers temperature of 155 F with meat thermometer. 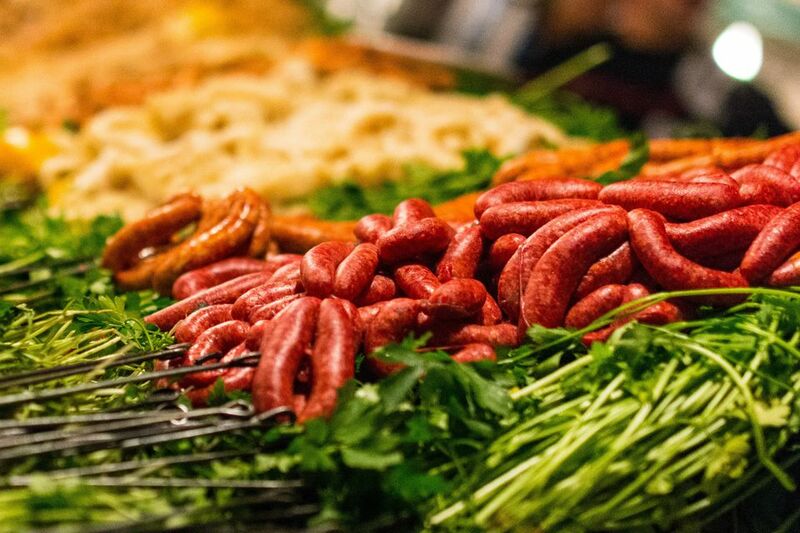 There are a number of ways to enjoy your homemade merguez. While they are great served plain, it's also common to eat them with couscous or eggs. The sausage makes an excellent sandwich and many people enjoy them stuffed into pastries as well.